The Cottage at Bantry Bay. It isn't always easy raising a family without much money, but the O'Sullivans prove that it is not only possible, but that there is no price tag on fun and adventure. 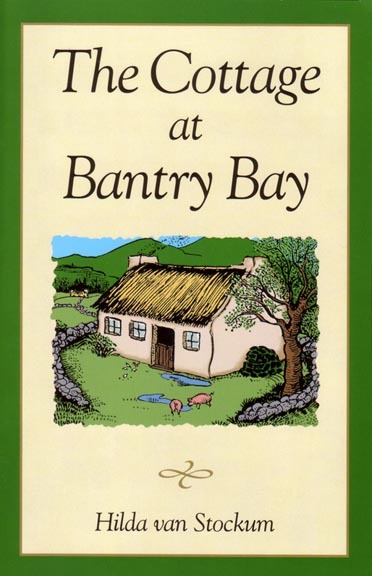 Father, Mother, Michael, Brigid and twins Francie and Liam share a warm and mirthful existence in their cottage at Bantry Bay—the fullness of which spills out into the Irish countryside round about. Michael and Brigid brave gypsies, bogs and lonely roads to sell a donkey in Kenmare for much needed cash, bringing back with them an outcast gypsy dog. It is this dog, Bran, who brings help to lost and hurting Francie and Liam when they have followed, in play, the English army too far from home. Bran also uncovers a secret which will enable Francie to be sent to Dublin for an operation on his foot. Here is a picture of an Ireland that once was; a story which is yet wonderfully timeless in its celebration of family love and hope. Ages 8 and up. Copyright 1938, 1966 / 1995. Sewn Softcover. 5.5 x 8.5 inches. 239 pp. Comment by Dr. Clark: Good family values of Irish family. Stories of Irish children at play and daily adventues. Some Catholicism: teacher tells story of St. Francis. St. Patrick mentioned. Most references to God are at end of sentences: God have mercy on us, God bless them, God bless you, God help him, etc. Some serious comments: We would have been lost if God did not have mercy on us. Family attended Mass, but the children have no idea of the meaning of Mass; at Mass, they "had the greatest admiration for the Child Jesus; they wished very much to be like Him." Several references to the English: starving the Irish; stealing of their property; fighting the English; poverty and persecution; several references to Queen Elizabeth. "There were times under Queen Elizabeth and later when Cromwell came over us like a scourge, that an Irishman's life was held cheaper than that of a rabbit by the roadside. The land was taken from him, the woods were cut down and sold, and he was driven up the bare mountains where he had to wring a living from the stones. The true Irish were allowed no learning, no religion, no poetry, no possessions, often not even food. Up in the wild roamed the patriots with the love of liberty in their hearts, longing to save Ireland but helpless as flies whose wings have been plucked."